Miss Jessie's Baby Butter Milk was created to hydrate and moisturize dry, brittle curls, kinks and waves without the greasy residue. Locks in moisture. Superb shine. Excellent lightweight coating. Will help cut down frizz. A great detangler for knots and kinks. Fortifies and moisturizes dull, lifeless curls. 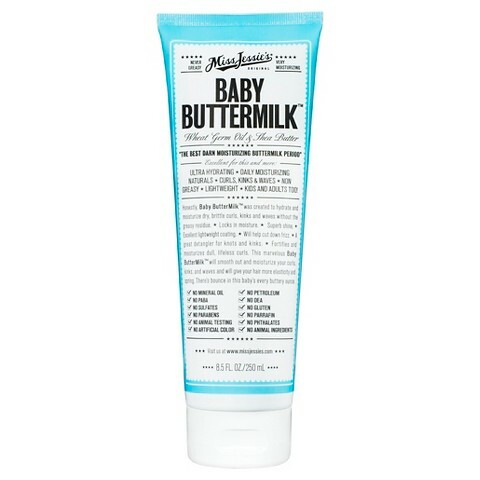 This marvelous Baby ButterMilk will smooth out and moisturize your curls, kinks, and waves and will give your hair more elasticity and spring. There’s bounce in this baby’s every buttery ounce.